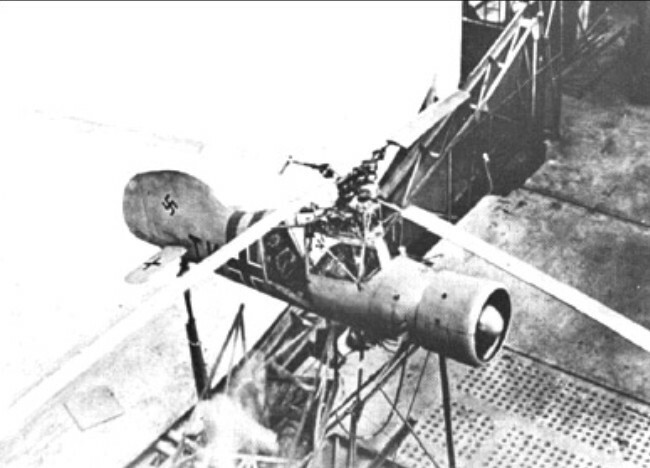 In 1937 Flettner began to design the first helicopter to use intermeshing contra-rotating synchronized rotors. Many of his advisers thought that the airflow disturbed by the intermeshing blades would make this system less efficient than one using a single rotor; but Flettner believed that any problems thus encountered would be more than offset by the reduced drag resulting from having no external rotor-carrying structure. Six Fl 265's were ordered in 1938 with a view to developing a machine suitable for shipboard reconnaissance and anti-submarine patrol for the German Navy. They were to be powered by a 7-cylinder air-cooled engine to drive its two intermeshing two-bladed rotors and with an inertia damping system to reduce the shake of the control stick. The six prototypes were built (Werk-Nr. 1579 -1584), one of which (TK+AN) was tested in the large wind tunnel at Chalais Meudon (Paris) in the summer of 1940. This was of similar airframe configuration to the Fl 185, but dispensed with the outriggers and propellers, and introduced two two-bladed counter-rotating inter-meshing and synchronised main rotors which, because they were rotating in opposite directions, each cancelled the effects of the other's torque. To simplify control problems a tail unit incorporated an adjustable tailplane for trimming purposes, and for steering a large fin and rudder to augment the use of differential collective-pitch change on the two rotors. The 160hp Bramo Sh 14A radial engine provided the power for the two two-blade rotors, which had inclined shafts mounted close together and had an inertia-damping system to reduce the vibration reaching the control column. The Fl 265 V1 D-EFLV took off on its maiden flight in May 1939 in the hands of Flugkapitan Richard Perlia following an extensive series of ground tests (first full-power run on 17.01.1939, first tethered flight at a height of 20 cm on 14.03.1939). D-EFLV made its first autorotative descents the following August, The aircraft was lost in an accident some three months later when the counter-rotating blades struck each other, but the Fl 265 V2 was used successfully for a variety of military trials. It was used for extensive military testing in conjunction with the Kriegsmarine (for example deck landings on an approximately 25-meter-square landing platform on the cruiser Köln and even made landings on U-boat decks) in the Baltic and Mediterranean. The aircraft was removed from service on April 29, 1940. One Fl 265 was lost due to its refuelling being overlooked. The Fl 265 V3 crashed due to pilot error on August 21, 1939 and was destroyed in the ensuing fire. The Fl 265 V5 (retired on 26.11.1941) and the Fl 265 V6 (retired 25.03.1942) were still on hand at the Flettner Company in November 1942. Their return to service was postponed and eventually abandoned. The Fl 282 exhibited significant improvements compared to preceding designs, for example the double rotor with intermeshing blades, automatic changeover from helicopter to autogiro flight (autorotation, from the V4), and the ability to switch back to helicopter flight. Although the Fl 265 had performed its duties well, had flown in adverse conditions and had no trouble going into and out of autorotation, natural doubts were expressed concerning its vulnerability to aerial attack. Consequently, a test was made in which a Messerschmitt Bf 109 and a Focke Wulf Fw 190 fitted with camera guns made determined simulated attacks on an Fl 265 for 20 minutes but failed to score one hit because of the helicopter's manoeuvrability. All the Fl 265 prototypes accumulated the following in the course of testing: pure flight time 126 hours, 32 minutes; takeoffs 1.180; running time 518 hours, 44 minutes (flight time + tethered flights + engine run-up time). At the time this represented a record number of hours of operation for a helicopter. In 1940, an order was placed for quantity production. By then, however, Flettner had designed a more advanced two-seat helicopter and it was decided instead to proceed with the development and manufacture of this improved aircraft.